Here's a secret about Android Wear: at the moment, even more than a year after the first Wear devices hit the market, most of these smartwatches use the same Snapdragon 400 system-on-a-chip. That means that outside of screen resolution and quality, and of course the cosmetic changes implemented by the different manufacturers, there isn't much difference between the latest models and the originals. That being the case, the first Samsung Gear Live (the square one) is still a pretty good way to get into Android Wear, if only to see if you actually like it. So a Gear Live for $80 is still a great deal, even if it's not quite the rock-bottom price we've seen on similar models like the G Watch. Update 11/2/15: The old deal was short-lived, but a new one popped up. See the updated link below. Update 11/16/15: The previous link is now showing $339.99, but a new seller has listed the blue variant for $289.99. Tax in NY, free shipping. 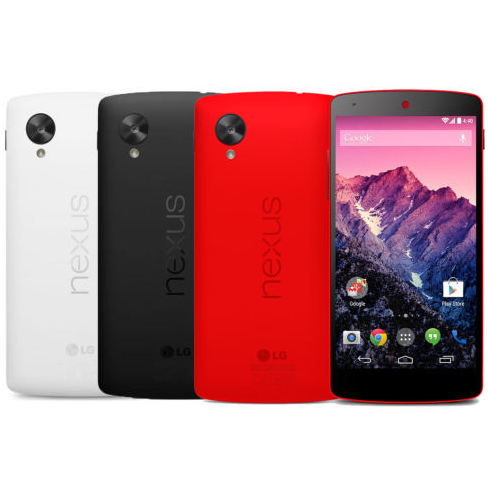 Right now everyone is drooling over the new Nexus 5X and Nexus 6P (especially since Android Police's exhaustive reviews of both went up this morning). But the Nexus 6 is still around, and it's still a fantastic phone, especially considering the crazy discounts we've been seeing lately. For example: this morning you can get a new 32GB model for just $289.99 from this eBay seller from this eBay seller from this eBay seller. Are you looking for a ludicrous amount of external battery power? Then look no further than Woot.com today. 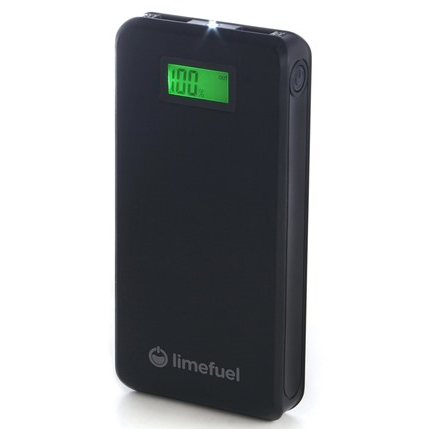 The electronics section of the site is offering a two-for-one deal on a Limefuel 15000mAh external battery pack for $39.99. That's an almost ludicrous 30,000 milliamp-hours, approximately ten complete recharges of even huge phones like the Nexus 6. Also I guess you could keep one and give the other to someone else. Weirdo. These particular batteries are pretty standard: they feature two charging ports each, 1 amp and 2.1 amps, plus an LED flashlight and a tiny LCD readout for viewing the battery level. 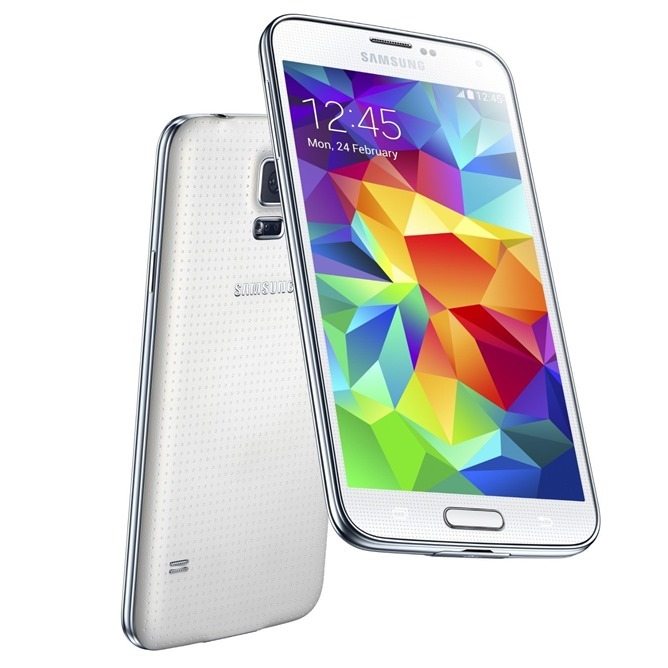 Case in point: eBay has the AT&T version of the Galaxy S5 on sale for $349.99. 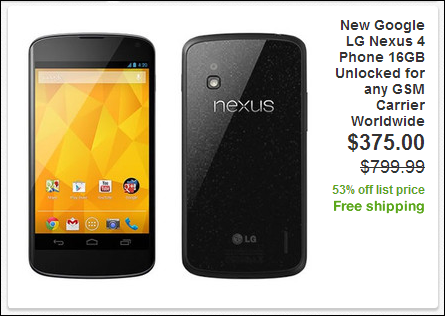 This is a phone that, just a few weeks ago, would have cost you $650-700 from any carrier without a contract. 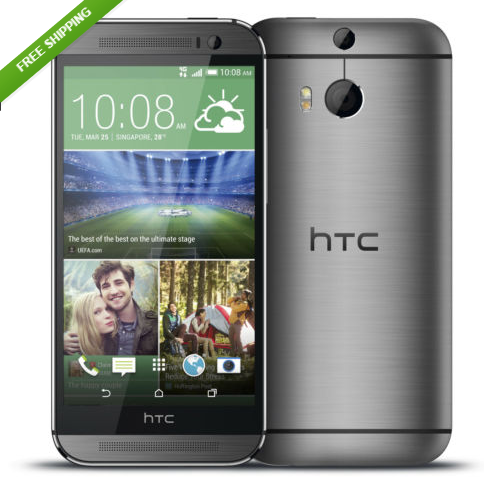 The HTC One M8 is one of the more desirable Android phones available at the moment, and if you're looking to find a good deal on one, "qualitycellz" (may not a be a real name) is happy to oblige on eBay. The seller has at least a few refurbished AT&T-branded One M8 models going for $449.99, a full $220 off of the new retail price at AT&T. You can have any color you want, so long as you want silver. For a device so new, this is a rare deal - assuming you're OK with the refurbished status of the One M8, you won't find a better price for the off-contract phone anywhere. Maybe that doesn't seem like much, but add in the fact that you get free shipping and no sales tax if you live outside California, and the savings add up. If I bought one from the Play Store and had it shipped here to Texas, the tax and $10 shipping would make the total $383.22, more than $40 above this eBay price. Update: That's all, folks. It looks like the deal has sold out. 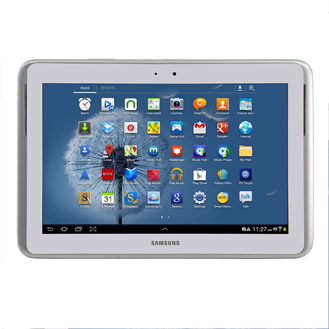 Say what you will about Samsung's plastic designs and overbearing skins, the original Galaxy Note 10.1 was and is one of the more capable stylus-enabled tablets on the market. 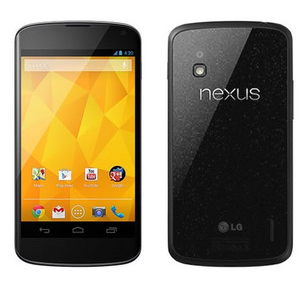 If you're looking for a good deal on the WiFi version, eBay has a refurbished model for just $229.99 . That's almost $300 off the original 2012 price, and still a solid $170 off of the retail price (even for a refurbished model). The Galaxy Note 10.1's biggest plus is the Wacom-powered digitizer and stylus (S-pen) combo that comes standard with all members of the Note family. You will find that Google may charge tax in your state. For example, in California, the Play Store adds on $30.54 of tax for me. The charge may be less in your state, or you may not get charged for tax at all, in which case the deal isn't as much of a deal anymore. Update 3/23/13: The deal is back yet again today. Update 12/01/12: It's back one more time. That headline seem oddly familiar? It should, because the same seller had an identical deal going about a week ago. And now it's back. 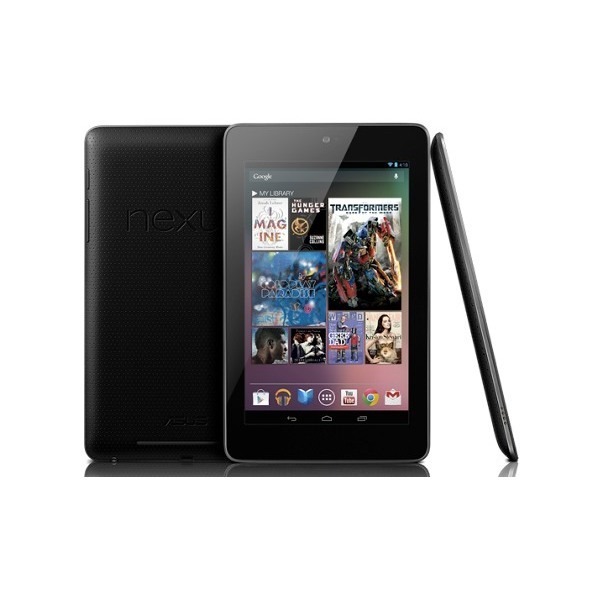 For today only, you can get a brand new, in box 32GB Nexus 7 for $229 shipped. That's your price out the door - unless you live in New Jersey, that is. In that case, you'll also have to fork over some sales tax. Sorry, guys. 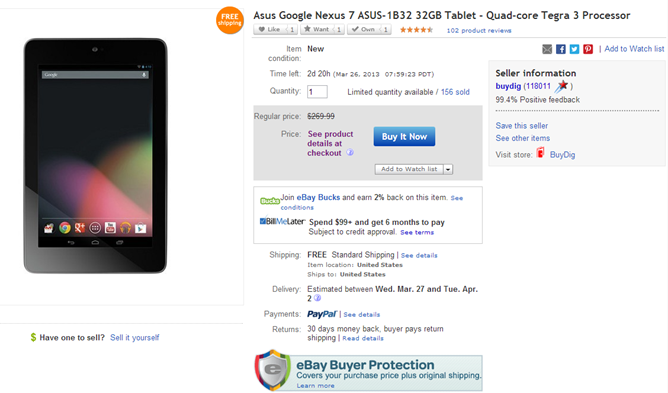 Still, that's quite a bit cheaper than you'll get it directly from Google.